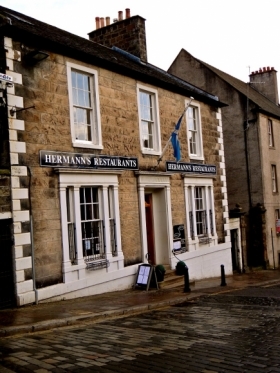 Hermann's Restaurant gets its name from Tyrolean owner Hermann Aschaber, and is located in the old town of Stirling, close to Stirling Castle. Hermann uses the best of Scottish produce to craft a menu that captures the Austrian favourites of schnitzel & strudel, with a variety of freshly prepared dishes to suit every taste...and a great favourite of European visitors. A cosy fire welcomes guests in winter, and an elegant function room overlooking Mar's Wark and the Church of the Holyrood is an excellent venue for small weddings & get-togethers.